Rewind Team Member Jari Kovalainen has an exclusive interview from Mr Tom Carpelan, the producer and CEO of the Finnish based company Oy Filmkompaniet Alpha Ab. The company now owns the worldwide rights for the Polish-Austrian The Moomins (Opowiadania muminków) (1978-1982) TV series and is also behind the major restoration from the original film materials. The restoration work produced by Carpelan has given a whole new life to a beloved children's series. Two international feature films (with a third in production) have been edited from the remastered prints and the rights of the films have been sold to almost 20 countries. The 78-part TV series has also been sold to many countries with over 15 different dub versions existing. Carpelan answers our questions from his office in Helsinki, Finland. What is your history with Tove Jansson's Moomins, especially with the Polish-Austrian animation series? Moomins was familiar to me in my childhood but mainly through the books. I never saw the Polish-Austrian animation series as a child. I was already studying when the series started to air in Finland(3). But as a buyer of rights I saw it the first time at an international fair in End during the 1980s, but it was not for sale to Scandinavia due to rights issues. I contacted the rights holders a couple of times but in 2006 I got to know that the series was now available to release in Scandinavia(4). What was the process for securing the rights to the series? Firstly we bought the distribution rights for the series, but the quality of the masters, even if we did digitally improve them, was very poor and disappointing so it was not very easy to distribute it. We started the negotiations with the rights owners and also with the Polish film lab who had vast experience in restorations and found out that nearly all negatives of the series were still available. The negatives were in very bad condition and it was only a matter of time when they would be in such bad shape that the cost of restoration would increase a lot. We are now the main owner worldwide for the rights to the series; the original producers from Poland and Austria both have minority shares in the rights. What was the process of restoration of the series? If I remember correctly, there were 76 out of 78 episodes as negatives and two episodes as only positives. For most episodes there were two negatives, one in Poland and one in Austria/Germany. We checked some of the negatives from both stocks and found out that they were in equally bad condition; but not so bad that the restoration would be extremely costly. We worked together with the Polish Film Lab called Labfilm (it has a very long Polish name...) and started with the digitalization of the 35mm negatives. The whole restoration was made at Labfilm and here in Finland we planned the colour scheme based on what kind of colours Tove Jansson usually used as we did not have any reference material. One interesting aspect of the whole restoration process was the fact that the series was produced in Poland for TV(5) at the time when most of the Polish TV-sets were black & white and the picture format was very small, so the production team did not worry very much about dust and debris within the frame and they were especially not concerned about how shadows from the production were visible in the picture (the animation with front glass layer and back glass layer created a lot of disturbing shadows). Our process was not only restoration but also improvements from the source material and those who were involved with the production in the 1980s have told me that our version is much better than the series was when it was brand new. It is difficult to estimate the total cost of the restoration, it has been going on for so many years and involved a lot of internal work as well. The cost has been very high, but it has been worth it. You decided to create a new 1.78:1 master, even when the original aspect ratio was 1.33:1. What were the reasons for this? When we made the decision to restore the series, we also wanted to have it in the digital picture format in order to have more options for distribution. We edited all pictures here in Finland so that we would not lose anything important from the different scenes and that it would look as if it were produced in 16:9, so yes, we tried to be very careful with changing the aspect ratio. We made one decision with the aspect ratio for the TV-series and did not reconsider any other formats. Could you tell us more about the different dubs of the series and the so-called "original audio"? Yes, the series was firstly dubbed in Polish and German. It was also edited in two formats. The original was 78 episodes of around 9 minutes in length (they vary a lot in lengths) and re-edited to 26 episodes of 26 minutes as I believe TV-half hours were a well selling format. Later Anne Wood (from Ragdoll Productions) made a new version of the series(6) with 100 x 5 minute episodes with new music, too. When we decided to restore the material, we also re-wrote the whole script; the original had very little text with merely a storyteller(7) and we felt a combination with a storyteller and dialogue would suit today’s audiences better. There is already an English version done of the (remastered) series but only shown in South Africa and in American English. We believe it will be released in the US, at least, very soon, but so far we have not managed to find UK distribution although we worked hard to find a proper home for the Moomins in the UK. 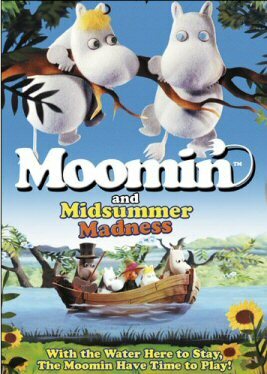 The first movie, Moomin and Midsummer Madness, will shortly be released in the UK. Is it possible to see the actual 78-part series on Blu-ray in HD and maybe with a proper 5.1 audio? Yes, all is possible. It depends on the local distributors. Two feature films were created from the remastered prints and one was even in 3D. Can you tell us more? The first movie, Moomin and Midsummer Madness, was an experiment; we felt that with the TV-series much was built on stories from the books but divided into many episodes, so we wanted instead to re-edit them into a complete story based on one book. In the second movie, we again wanted to create even more of the 3D feeling the creators originally had in mind with using the glass layers. We are planning a third movie based on the series. The project is advancing well and it is likely to be released in 2016. However, we are not involved in the upcoming feature film Moomins on the Riviera(8), but the screenshots I have seen look very nice. We are now, besides the Moomin movie mentioned above, also involved in a very interesting TV series, which was considered to be lost as the original producer got Alzheimers and no one knew where the negatives were. 20 years later they were found by his son in a warehouse in Chicago, still in reasonable condition. We hope to be able to have all in place with this production so that we can go out with info in the Autumn. Here we also plan to produce a completely new series. For more info, please also see Part 1 of this feature - the visual comparisons with screenshots. (1) Amongst other productions in Finland and Sweden, Jörn Donner has produced Ingmar Bergman Fanny and Alexander (1982). To date he’s the only Finn to win an Oscar! (2) Danish based animated film is known internationally as Amazon Jack 2: The Movie Star or Hugo the Movie Star. (3) The series first aired on Finnish television on a commercial channel MTV from 9 January 1980 with the name Muumilaakson tarinoita. It was only later when the current Finnish title Muumien maailma was introduced. 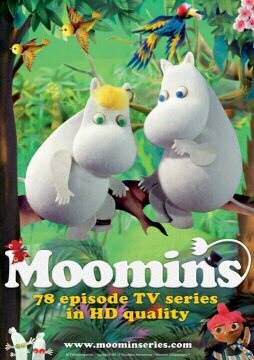 To make things confusing, it was the later Japanese-Finnish-Dutch co-production Moomin AKA Tanoshii Mumin Ikka (1990-1992) that ultimately got the original Finnish name Muumilaakson tarinoita and really started the Moomin boom in Finland. (4) The first Scandinavian DVD was released in 2007. (5) Colour television was introduced in Poland in 1971. (6) Anne Wood adapted the British version of the series which was originally narrated by the comedian Richard Murdoch. It was often referred to as The Fuzzy Felt Moomins. (7) The original Finnish dub was also narrated by one actor, Harri Hyttinen. This was the style used when the series was originally introduced to different countries. All new dubs for the remastered series include several different voice actors. (8) Moomins on the Riviera is an upcoming Finnish-French feature animation film, directed by Xavier Picard. It’ll be released later this year.